Vernie Mae Nichols age 71, of Dewitt, MI, passed away Thursday, November 1, 2018, at Sparrow Hospital, Lansing, MI. Visitation will be held at Smith Family Funeral Homes - Osgood Chapel, St. Johns, MI on Sunday, November 4, 2018, from 4-8 P.M. A Memorial Service will be held at the funeral home on Monday, November 5, 2018 at 1:00 P.M., with Rev. Matthew Olson officiating, and with visitation from 11:00 A.M. until time of service. Vernie was born in Chicago, IL, on November 20, 1946, the daughter of Dean and Betty Jean (Waldon) Harwell. On February 6, 1965 Vernie married Gerald Nichols in Chicago, IL. When their children were in high school, Vernie and Gerald went back together and earned their High School Diplomas from St. Johns High School. Vernie later received an associate’s degree from Lansing Community College. She was a computer graphic artist for MSU - Criminal Justice Department. Vernie was very involved in her children and grandchildren's lives and a mother to many people. She was a Girl Scout leader, Theater Mom, and softball coach. Vernie and Gerald started the Wooden Nickles 4-H Club. She was a professional cake decorator. Vernie loved music, camping, reading, sewing, Trivial Pursuit, and genealogy. She had a strong faith in God and instilled that with her children. Later in life, Vernie enjoyed bowling and was an avid slot machine enthusiast. These things were always better when shared with Gerald and close friends. 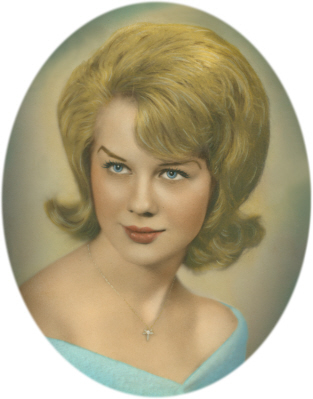 Vernie is survived by her loving husband and hero of 53 years Gerald of DeWitt, 3 children: Sherri (Jeff) Kolb of Grand Ledge, Gerry (Jacey) Nichols of Durand, and Lori Jean Nichols of Lansing. She is also survived by 7 grandchildren: Katelyn Nichols, Conner (Margo) Nichols, Samuel Nichols, Sophie Young, Joshua Kolb, Johnny Kolb, and Jeffrey Kolb; great grandson Ronan, sister Mary (Keith) Lee and many nieces and nephews. Vernie was preceded in death by her parents, father and mother-in-law Lloyd and Doris Nichols, sister Deloris "DeeDee" Barnhart, and sister-in-law Wilma Barnhart. Donations may be made to the charity of your choice. To leave an online condolence for the family, please visit www.smithfamilyfuneralhomes.com. The family is being served by Smith Family Funeral Homes - Osgood Chapel, St. Johns, MI.